Installing an awning is an important investment of your time and money, because an awning will become a part of the appearance and function of your home. Here are a few things that you should consider before you make a purchase. Where are you planning to install your new awning? Over a door or window? A fixed awning might be the best choice for you. Over a patio or deck? A retractable awning might be your best option. In front of a business? The type of awning you'll need will depend on space and function. If you're planning to use your awning over your patio or deck, you'll want to make sure that it extends to the very end of the structure, or even a little further. You'll, also, want to be sure that your awning can fully extend without anything getting in the way. Can an awning be mounted to the space you have? In order to install an awning, you need to have enough wall space that's completely clear of obstruction. You will not be able to properly mount an awning if anything gets in the way of its hardware. This includes windows, pipes, chimneys and light fixtures. Window and door awnings usually need to be installed 6 to 12 inches above the frame. Deck awnings will need to be around 7 to 8 feet above the ground. Make sure that there is ample space above your structure. Always check with the product manual for any special requirements and specific instructions on installing your particular awning. Measure the wall where your window is located. Measure the entire length of the window or door. Measure the entire width of the window or door. Please be aware that, as a rule, the fabric of most awnings is 6 inches less than the total width of the awning to accommodate for framework. 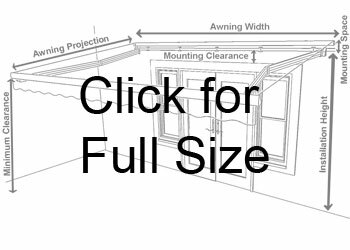 Measure the height of the wall that you want to install your awning. 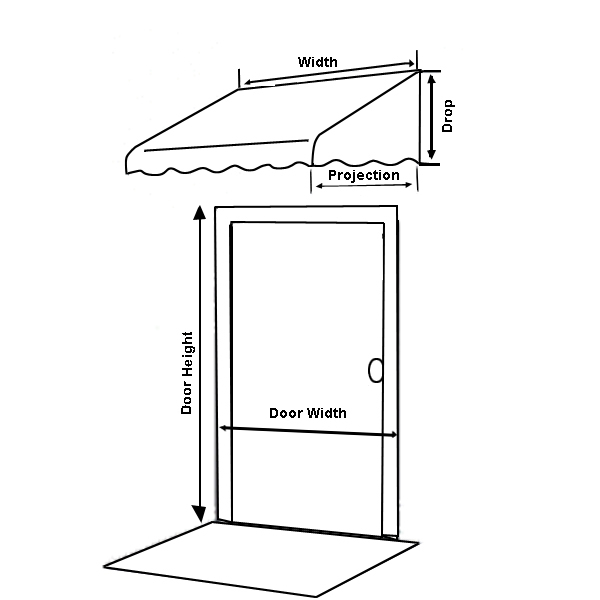 Measure the width of the structure you want to cover - this will tell you how wide of an awning you want. Note: The fabric of your awning will be around 6 inches less than the total awning width. Measure the distance from the wall to the end of your structure or further, depending on how far you want your awning to extend. Measure the space between the roof and any windows or doors, making sure that there is enough space to mount your awning. Check and make sure that there is adequate room for the slope of your awning. Most will have a slope of about 15 degrees to let rain run off. Say that you mount an awning with a 12 foot projecting 8 feet off the ground. It will need 7 feet clearance at its outer edge when fully extended.